This paper discusses nuclear fusion, The technology is, on paper, very attractive. Although exploiting the nuclear strong force, it generates little radioactive waste and has the potential eventually to generate none. It cannot be weaponised and is intrinsically safe in operation. The fuel that it uses is either bred through its own operation or widely available wherever there is in water. That said, this is probably the most difficult technical problem that humanity has every set out to solve. That said, computation power and the understanding of plasma fluid dynamics, to give but two examples, have made extraordinary progress possible. Fusion has had a number of test beds working throughout the past twenty years that have now yielded a very thorough understanding of the system that engineers are trying to harness. The paper is divided into two sections. First, the implications of a fusion breakthrough are considered: the roll out process, the impact and the economics. Second, for the moderately technically minded, we offer a simple review of what is involved, and the main technologies that are in play. What are the implications of a fusion breakthrough? Nuclear energy has been over-promised, and the public has reacted to this. Slogans such as "Fusion, the energy that will always be the energy of the future" can be read with an ironic voice. Nevertheless, the promise of fusion is extraordinary and we may be at the beginnings of its delivery, if not as a mature technology, at least as an avenue of definite promise. There are two limits to achieving useful fusion, The first is straightforward: has cost a lot of money and will continue to do so. The second is that this is an extraordinary feat of science and engineering, which has to proceed iteratively and through the expansion of fundamental knowledge. The technical issues are discussed below. Funding, however, remains problematic. 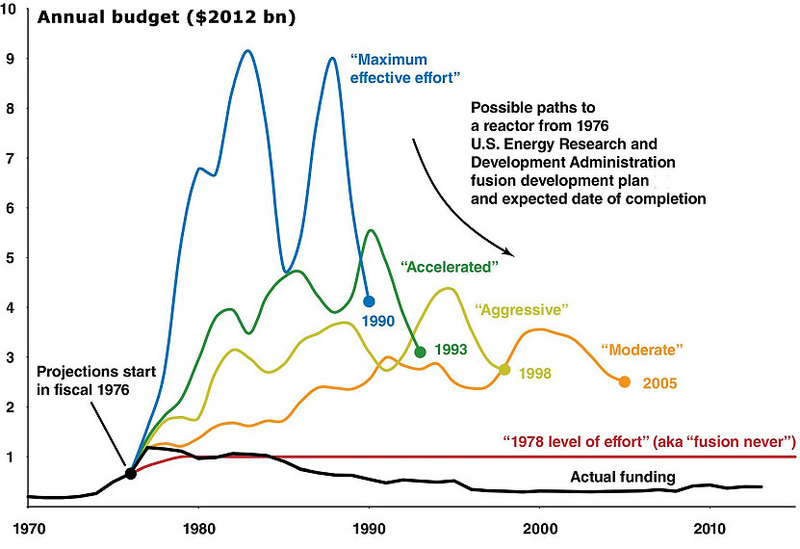 The figure shows three scenarios for fusion funding, and the actual expenditure since 1976. The shortfall is evident. The world spends US$7.5 trillion on energy, but roughly US$ 15 bn on public sector energy-related research every year. That is about 0.2% of sales, which is a very small sum, and much of this goes on routes to energy conservation, renewables and private sector research subsidies, in the shape of tax rebates. To calibrate this, BP set aside US$ 20 bn to cover the cost of the Gulf spill. There have been a wide range of guesses about the arrival of fusion, as exemplified by the chart which is shown above. Projects respond to capital inputs in exact proportion to their readiness. Nixon's war on cancer in the 1970s produced nothing useful because the state of knowledge - and human infrastructure - was not ready for fast expansion. Much the same was, as we now know, true of the period when these estimates were produced. That is not the case today. The section on technical potential shows that we are now in a position in which major funding would bring the date in which commercial fusion would be available, and that whilst the exact route to this is as yet unknown, the technical risks are now quite well contained. In essence, we will get fusion at a date in the future that is directly set by our willingness to invest in it. Suppose that we had access to unlimited funds and that it was clear today how to spend them? The figure shows work done by Shell on the pace at which energy technologies penetrate the global market. Plainly, the economic potential and the regulatory environment will effect these, but the general trend is clear enough. Fusion, if available today, would take a considerable time to replace and extend existing electricity infrastructure. What consequences would even the knowledge of its certain existence have on the world? It would, self-evidently, render investment in all but a few renewables obsolete. It would change our perception of primary energy from a limited to an unlimited resource, or one properly limited only by economic realities. It would considerably reduce the long run potential of the oil producing countries, and increase those of, in particular, poor importing nations. However, given the slow penetration that the figure shows, these would be impacts anticipated rather than felt in 2025. The forced retirement of conventional power stations by states as a climate management measure could well bring this forward, but still to the 2030s and beyond. The nature of the plant - turnkey modules or complex, delicate equipment that needed constant expert management - would greatly impact poor-world uptake, and hydrocarbons could become "poor man's energy" in such an environment. Of course, if one of the odd-ball models described in the last section were to take off, this would change many things. But it would be unlikely to change the penetration rate profile unless the economics were supremely attractive. All atoms want to be Iron, the nucleus with the lowest binding energy. When unstable heavier nuclei decay to lighter ones, they emit energy placed in them by the supernova in which they were created. This release is the principle of the fission reactor. Many of the decay products are themselves radioactive, leading to the primary problem with fission, which is that it leaves contaminants. In addition, heavy nuclei are rare, and so innately limited in the long term potential that they can offer. By contrast, Hydrogen is the most abundant element in the universe. Light nuclei such as Hydrogen release energy when they are forced together, fusing to become more like Iron. This is how the Sun shines. Nuclei have positive charges, however, which makes them repel each other until extremely close and, as a result, to achieve useful levels of fusion it is necessary for light nuclei to be forced close together, and in large numbers. Our Sun and its peers achieve this by using their enormous gravity. As our technology cannot manipulate gravity, we have to use other means to achieve the same end. All promising techniques do this by creating a "plasma", a state of matter in which atoms lose their electrons, heating this enormously to make each individual nucleus move very fast with respect to each other, and compressing the plasma so that they collide frequently. Keeping this all together is referred to as "confinement". There are two generic ways of confining a plasma. One uses magnetic fields and the other, the inertia of the plasma itself. Both rely on external energy to heat the plasma and bring about reactions. These are not self-sustaining, and if the external energy source is turned off they immediately cease. The magnetic field containment schemes use either microwaves or an electrical current to do this, plasmas being conductive. The inertial schemes, by contrast, are essentially explosions within which the plasma is short lived. It is confined and heated by the effects of the explosion, requiring exquisite precision if useful yields are to be achieved. Fusion reactors thus take in energy - to confine, to heat - and release products that are captured to yield heat. the heat is then used to generate electricity, some of which is cycled back into the needs of the plant. The ratio of these two is the "yeld" of the plant, which needs to be around ten - that is, ten times more net production than is used internally - if the scheme are to be remotely economic. Fusion relies on "nuclear chemistry", whereby specific nuclei are collided in the reactor. For example, the most straightforward of these uses two isotopes of Hydrogen, Deuterium and Tritium. These fuse and create two daughter products, which carry away the energy. These are the element Helium and a neutron. Reactors are designed to capture these products with a molten blanket of the common light metal, Lithium. When Lithium is struck by a neutron, it transmutes to Tritium, which can be separated and used in subsequent cycles. Deuterium occurs naturally. This cycle has the disadvantage that neutron capture is difficult, and the neutron fluxes are likely to be large. This may weaken structural materials, and make the reaction vessel radioactive. Other cycles include the dual Deuterium reaction, which has similar problems and even more energetic neutron fluxes. Other reactions include a proton-Boron-11 reaction, which does not generate neutrons or other radioactive materials. Boron is widely available. Unhappily, this reaction requires much higher confinement energies - perhaps 500 times higher - than does the Deuterium-Tritium pathway. There have been suggestions for accelerator-based reactors, where the proton is fired at a Boron target, and the resulting Helium nuclei forced to gyrate in an intense magnetic field. They would then release microwaves, which can be absorbed efficiently. This is likely to have an energy yield under three times, even on paper, and will probably not proe economic. Fusion has enormous potential advantages. There is no intrinsic fuel shortage, and no concentration of it to generate geopolitical stress. It is impossible to make a fusion reactor explode in anything but the most trivial sense. Wastes are both small in volume and where radioactive, trivially so. Tritium if not burned, has a half life of around twelve years and decays through non-penetrating beta emission. That said, realising it is an immense technical challenge. Inertial confinement schemes are, as mentioned, small individual explosions during which an external source of energy crushes a target to the state at which fusion becomes possible. One leading inertial confinement scheme use lasers to explode a container around the material to be fused, and this in turn emits shock waves to compress the plasma and x rays to heat it. A new version of this technology uses one laser shot to compress the fuel pellet and another pulse, from a separate set of laser, to heat it. Advances in solid state lasers make this an attractive prospect. 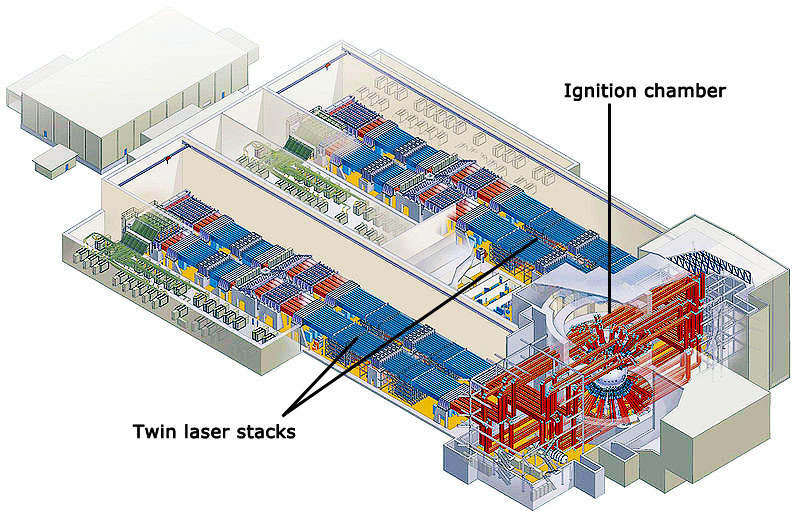 Pure laser confinement is being developed at the US National Ignition Facility (NIF), which achieved fusion with a limited number of the planned lasers in 2010. The European Union HiPER facility is focused around secondary heating, the so-called "fast ignition". The NIF approach is limited to a theoretical energy gain of about five, the HiPer design to a gain of 100. To put the demands of the technology in perspective, NIF has to crush the plasma to a density of around 1000 grams per cubic centimetre. Metallic lead is 11 grams per cubic centimetre. HiPer, with its two-laser approach, can "get away with" a density that is "only" thirty times that of lead. A second front runner, magneto-inertial fusion, is based on Sandia Lads. This creates and collapses intensely strong magnetic fields around the candidate material. This is both compressed and heated by the dying magnetic field. To date, efforts have focused more on generating the intense current pulse that is required than in achieving fusion. Each of these schemes are innately intermittent. Lasers currently take a while to regenerate, and whilst automated fuel feeds are easily designed, rapid fire lasers - say, at a at a rate of five shots a second - are still far from current technology. A commercial fusion plant that is based on this technology is defined by this limitation more than any other. Tokamaks consist of a torus of plasma, held in place by complex magnetic fields that spiral around it and compress it. 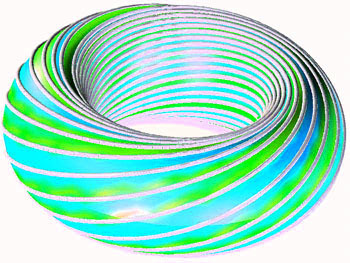 The field comes from huge magnets that wrap around the torus, and a strong current within the plasma, that stretches these out into the helix. The current is induced by a second set of magnets, and will amount to fifteen million amperes in ITER (see below). In addition, fuel must be injected and energy extracted, as discussed above. As the reaction products are intended to leave the confines of the magnetic field and thus the plasma itself, the plasma has to be heated externally, which is now usually done using microwaves of the right frequency and polarisation. A moment's thought shows this to be a strikingly complex device, and one where the most crucial components are (a) radioactive and (b) embedded deep within the body of the equipment. Superconducting magnets, operating at a few degrees kelvin and bearing tens of tonnes of mechanical stress, are mounted metres away from molten Lithium, steam raising systems and a plasma at the heat of the Sun. The plasma is innately prone to self-reinforcing instabilities that have to be managed on a micro-second base. 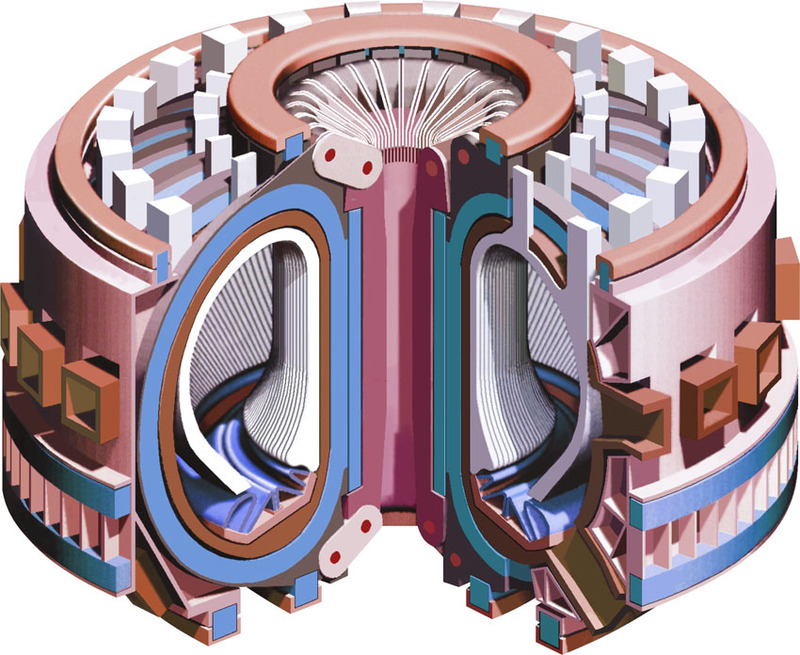 The current largest Tokamak is the Joint European Torus, which has produced a peak of 16.1 megawatts of fusion power - a little more than half the input energy - and sustained a lesser 10 MW output for a dizzy half second. Its successor is the ITER. ITER is aimed to produce 500 megawatts of fusion power for up to 500 seconds, giving a yield of ten times input. The original budget, on which it achieved international funding, was Euro 10 billion, agreed before the financial crisis. It now stands at Euro 15 bn, in a far less forgiving economic environment. The EU is required to find 45% of this, and so far has been unable to do so. Green groups and the German green party are against ITER, for reasons that remain unclear. If it receives its funding, it is expected to give its first sustained plasma around 2020. The IFMIF (International Fusion Materials Irradiation Facility) is being built in parallel to test materials under neutron bombardment for subsequent commercial plant, perhaps on stream before 2040. The potential of fusion has attracted a wide range of contributors, from amateurs through commercial organisations to state laboratories. One or two designs exist that have potential, One of them, coaxial or focus fusion, relies on two electrodes, one inside the other, one tapering and the other straight. The space between them contains the reactant gases, which are subject to an intense current. The current sheet is swept to the taped cylinder end, where it sheds vortices that appear to generate fusion; certainly, neutron fluxes are measured. Programs that use microelectrodes, including carbon nanotubes, to launch Deuterium protons into a Deuterium-containing target have been shown to generate neutrons of the right energy to indicate fusion. However, the energy yield is trivial. Pyroelectric fusion is the name given to this class of apparatus. Speculative ideas include the so-called Cold Fusion experiments. These were reviewed twice by the US DoE, in both cases concluding that the evidence was "unpersuasive". The newer devices - now dressed up as "Low-Energy Nuclear Reaction" or LENR - include the widely publicised E-Cat, a scheme that uses Nickel and Hydrogen to somehow create an energy excess, allegedly converting Nickel to Copper. "For NASA Langley, the epiphany moment on LENR was the publication of the Widom-Larsen [model]. The theory appears to explain nearly all [...] experimental observations, and shifts the LENR theoretical focus from some way of "fooling" [physics]. [V]ia condensed matter quantum physics, LENR is allowable without any "miracles." The theory states that once some energy is added to load surfaces with hydrogen, if the surface morphology enables high localized voltage gradients, then [surface polaritons - the text says "heavy electrons", which is over-popularisation - generate] ultra low energy neutrons [which] never leave the surface. The neutrons set up isotope cascades which result in beta decay [and] heat. This text is written in convoluted English. There are two NASA videos linked to it which give a bit more detail. However, people will want to know what a "surface polariton" is. This is a widely accepted concept that has a very substantial literature. To understand it, we need to start from the idea of a surface plasmon. Now, being an excitation of the field, the plasmon has to be quantised. Under special circumstances, these quanta take on special properties, in which circumstances they are called are called polaritons. Here, the field is coupled to incident light in ways that create what is called a quasi-particle. Do not be alarmed by the word "quasi-particle": examples of quasi-particles include the "hole" that allows semiconductors to carry out their magic. Impurities with insufficient electrons - or too many - to handshake with silicon give rise to free electrons and to "holes", which between them allow one-way flow, switching and all the other things that go to make a chip or single transistor. Polaritons are likely to be the base for a whole new technology, whereby light is switched in crystalline media, offering new computing prospects, new kinds of lenses and other optical media. They are implicated in everything from super fluidity to super conduction. What NASA are suggesting is that the combination of polaritons and the charges that build up - often to huge voltages - across small areas of a crystal can, under some circumstances, interact with polaritons to accelerate these. The consequence of interactions with heavy atoms - the mention Nickle and Coper in the video - lead to neutron emission. These neutrons then (perhaps) interact with protons (Hydrogen) to create fusion. As the text notes, every element wants to be Iron, and both Copper and Nickle are a gnat's whisker from reaching that goal, implying a very weak path to follow without the Hydrogen being involved. In brief, watch this space, I think. Broadly, if there is something there, someone will find it. You have missed the most bizarre - but surprisingly practical - model of fusion under development. This comes from Canadian GeneralFusion Inc. and is an inertial fusion scheme that uses steam-powered rams to create focused shock waves. The reactor vessel is spherical, about three meters in diameter, and filled with a liquid mixture of lithium and lead. The liquid metal is spun, creating a central cavity like the core in an apple. This has the job of absorbing neutrons created by any reaction. It is possible to create a self-sustaining torus of plasma, much like a smoke ring. (The US military experimented with these for decades, looking for an anti-satellite or anti-warhead weapon.) Two of these, consisting of a tritium-deuterium plasma, are injected from either end of the "apple core", meeting in the middle. Now, we turn to the "steam" element. Arranged around the swirling metal core are over two hundred hydraulic rams. These are the key engineering challenge, as they have to drive into the metal exactly simultaneously, doing so at around a hundred metres per second. The result is a shock wave that focuses in on the centre of the core. This is timed to arrive just as the two plasma tori reach the centre: crunch, Helium and neutrons. Plainly, the cycle time, the longevity of machinery exposed to such stress and the basic engineering are all issues to contend with. However, preliminary results are said to be promising and they aim to have net energy generation by 2014. This "heavy electron" thing does seem to have some reality. A Yazdani et al (Nature June 14 2012) reports from the Princeton-led team which included scientists from Los Alamos National Laboratory (and the University of California-Irvine. They used direct imaging of electron waves showing these to gain mass, arriving at masses up to a thousad times that of free electrons. Cooling these materials also made them superconducting. They show that the heavy electrons are not polaritons, but composite objects made of two entangled forms of the electron. In general, quite a number of observations now show that that electrons in certain solids behave as particles with masses hundreds to thousands of times larger than that of electrons moving freely in a vacuum. Various theories - such as polariton coupluing - had been advanced to explain this. Now, those tools have been realised. The implicatiosn to both LENR and "warm" superconduction are clear. This text from entirely serious physicists suggests a fully reproducible effect. Its English is a degree dodgy, but in essence they report that if you saturate Palladium with hydrogen, cool it slowly to liquid Nitrogen temperatures and then heat it quickly to about 50C, you get a burst of neutrons. This is inexplicable in terms of conventional physics, but clear provides a reproducible experiment from which to work. The US navy report a decade of research into LENR here (PDF). The report 1862 was compiled for the Office of Navy Research in collaboration with the Space and Naval Warfare Systems Center, San Diego, the Naval Air Warfare Center, Weapons Division China Lake and the Naval Research Laboratory (NRL). Quote "We do not know if Cold Fusion will be the answer to future energy needs. but we do know the existence of [the] Cold Fusion phenomenon through repeated observations by scientists throughout the world." Sandia Laboratories have been working on extremely high pulsed power for decades. This has the capacity to create enormous magnetic fields, effectively crushing anything placed within them. Initially funded as a non-fission pathway to fusion bombs (DOVE) it has since shifted to civil uses, including fusion research. A forthcoming Sandia research paper in Physical Review Letters suggests that they have reached fusion break-even and expect to scale up to commercial fusion yields. The technique is called MagLIF (Magnetized Liner Inertial Fusion), and works in precisely the same way as laser inertial confinement fusion, except that the pressure derives from magnetic and not light pressure. Deuterium and Tritium is contained in Beryllium capsules which are crushed in the intense field. The 25 million ampere Z machine will yield slightly more energy than is put into it, but a scale up to 60 MA woudl deliver fusion at roughly 1000 times the input energy. This is far beyond the scope expected from laser confinement, and does not require the optical finesse, cleanliness and stress resistance of a laser system. Postscript: the Z pinch technology from Sandia is now the focus of a NASA-Oak Ridge - University of Alabama attempt to develop a fusion-powered jet engine. Popular-level story here, with diagram and photo of the current source.